Behind the Scenes traveled abroad as the marketing designer/manager for three international hotel companies: the Ritz Taipei, The Sheraton Taipei and the Soto Grande Hotels on the Costa del Sol in southern Spain. 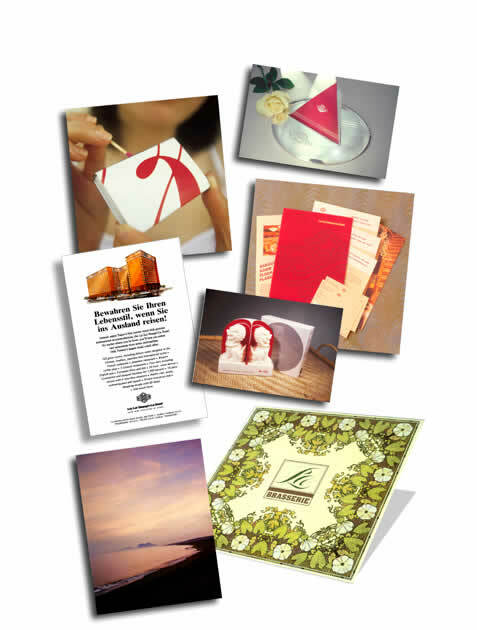 Michael's work for hotels includes all marketing design and copy, including sales kits, menus, restaurant logos, ads and in-room literature. For the Ritz Taipei, our identity program included closely cropped sections of the hotel's script logotype, reproduced on hotel literature, soap, sugar packets, and bar matches (shown). For the Sheraton Taipei, an ad campaign, anchored by the slogan "Alive with your style of living," was translated into six languages and helped make the hotel the most profitable in Asia (German translation shown). The sales kit for that hotel (shown) was distributed to 3000 travel agencies internationally. In Spain, for the Soto Grande Hotels, Michael wrote the english language slogan: "In the Andalusian hills on the coast of tomorrow," capitalizing on the unique local geography where the mountains topple directly into the Mediterranean near Gibraltar (shown). Also pictured are the silver plated and paper art deco menu for Paris 1930, the french restaurant at the Ritz Taipei, and the menu for La Brasserie, based on a William Morris wallpaper pattern. The guest soap was created for the grand opening at the Ritz, and has become one of the most popular souvenirs in the Republic of China. Please see Paris 1930 menu, Ritz guest soap package, Sheraton Taipei sales kit, hotel identity programs, and restaurant menus for additional information on these and other hospitality assignments. Behind the Scenes can assist you with any of your marketing goals for hotels and restaurants, call us today!.